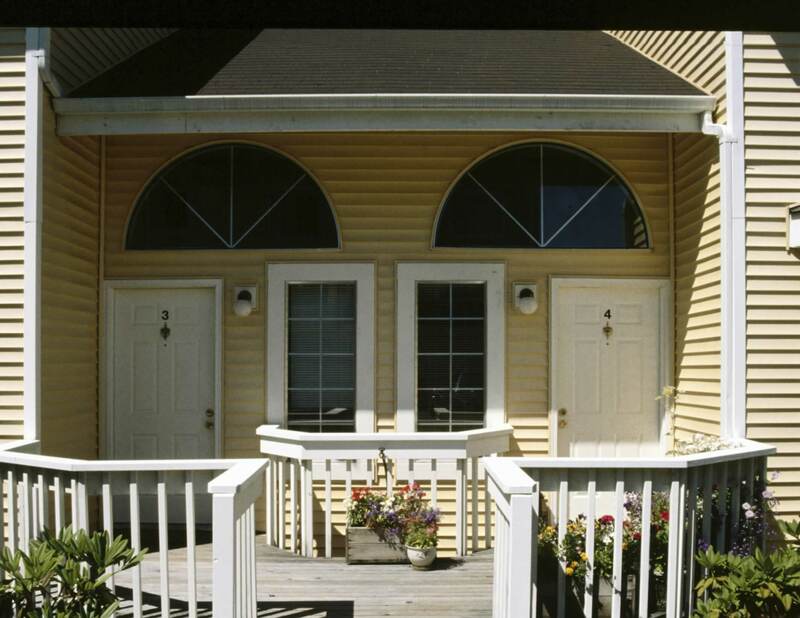 The shared front porch of this duplex illustrates how the door and window arrangement of unit number 3 is a mirror image of unit number 4. The door itself is a panel door referred to as Christian door, a style popular in Colonial New England. The door's stiles and rails at the top of the door form a pattern of a cross. The lower two stiles and rails look like an open book, which is meant to represent the Bible. This style of door is also called a cross-and-bible door. In the middle of the cross, a brass knocker is set above a peep hole. In addition to the unit number, each door has a brass knob and dead bolt. Because these are front doors for two duplex units, one unit's door is hinged on the left and the other is hinged on the right. The door is constructed of wood and is finished with white enamel to match the porch railing, door jambs, and window frames.